I would like to nominate the Kobolds of Idona Keep, by the Boot Camp of Valhalla, for your consideration. The powers, while mostly new, draw strongly from the MacDirk Warriors and Greenscale Warriors. They have weak stats and die easily, as their sculpts reflect, but can move (currently) up to 9 figures in one turn, depending on their Master. Rather than simply boosting old units, they create their own army archetype, which can breathe new life into those units. While their first power is somewhat complicated, it plays intuitively, requiring minimal memorization and no extra markers. The remaining powers are both extremely simple, and the entire card hinges on a single mechanic - the Master - instead of multiple, conflicting ideas. The Kobolds introduce a new species (Kobolds!) and provides synergy to a new class (Warriors!). The ability to take a turn with an indeterminate number of squad figures is a design space that has been largely untapped, as well, as is the means by which they obtain it. They're a unique unit that still fits into the larger Heroscape universe. They also create a new type of swarm army, something that is uncommon among the "good" Generals. Rather than Dungeons & Dragons Kobolds, these Kobolds originate from Valhalla, and we imagine them as the traditional manservants, squires, and defenders of the Kyrie (all of whom have the "Warrior" class). This is a departure from the usual sort of Kobold, instead drawing on one of the original Germanic versions of the creatures (seen HERE). This is like the Orcs, Wolves, and Kyrie that the original creators of Heroscape imagined - similar in some ways to the usual fantasy races, but unique to the Heroscape brand. 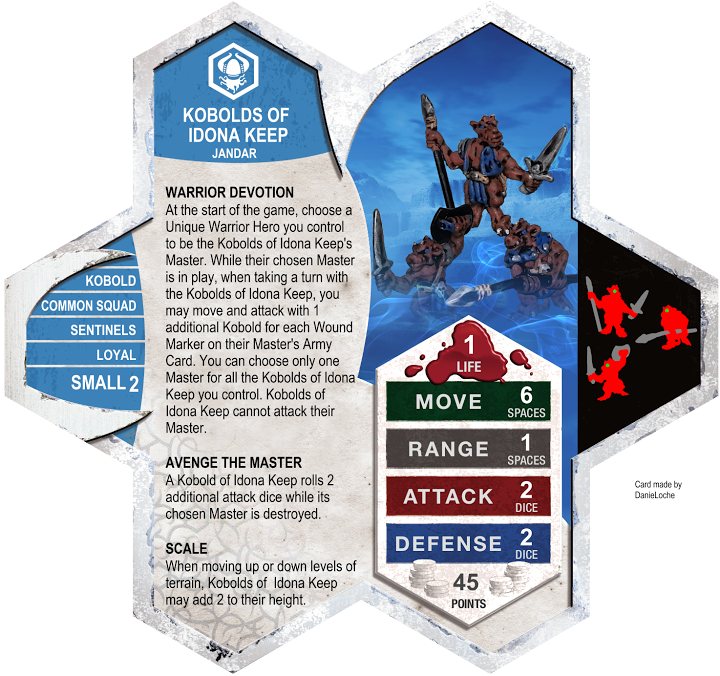 Their class and personality reflect this, with these specific Kobolds acting as the sentinels for Idona Castle's keep - the castle itself being the setting for The West Barbican of Idona Castle, an official Heroscape map (seen HERE). The figures used are the Kobolds from the Legendary Encounters series of miniatures (seen HERE). They are three unique sculpts, designed to compliment each other, and with colors appropriate for their alignment. These miniatures are in continual production and will be reprinted after the current Reaper Bones Kickstarter is fulfilled (according to THIS post on their official forums) - likely by next Spring. They are available for $6 a squad from the official site, making it $2 a figure - in addition, they are available unpainted for less than 60 cents a figure (seen HERE), giving an even cheaper option for those that want multiple squads and are less concerned about the paintjob. To anybody who's wondering about "synergy creep" I think this synergy is different. To me, this isn't a way to make the warriors better. The kobolds are made usable by the warriors, who don't benefit all that much from the bonding. The kobolds are as happy with their master dead as with him alive. I vote because I think it looks fun, and from reports I've read, it also seems balanced. And I think Kyrie boosting is a thematic idea, seeing as they're from Valhalla and all. Last edited by superfrog; November 23rd, 2014 at 01:20 AM. Anyway, to the point: we considered these guys internally in C3V. Interest fizzled a little after we got some comparison photos next to other Heroscape figures, though. They are really small - smaller than the cutters by a noticeable amount. I don't think it's out of the question for a figure this size to play in Heroscape, but it's pushing it. One such image. I think they work as the "devoted house servants" type of kobold. Kobolds are so small because they're the pets of Kyrie. Their size could be an issue. Is it thematic for a figure that small to get 4 attack dice? Other than that I like the card very much. I'm not worried about the size of the figures. It's just what happens when you have to choose miniatures from other games. My biggest issue is that they are Deathchasers without bonding or Drones (with more variable activations) with one less attack and defense. They're a little discounted from both comparison points, but I still think they are a little worse. I'm not sure what situation I'd want to play them in over one of those two squads, but the Warrior synergy could be hard to see from a theoryscape pespective. That's a testing issue though, so to review. I think there's a lot to be said for versatility here, they're not either Deathchasers or Drones, they're both over the course of the game. It also helps that you get 'Drones' early game where you typically want more movement and number of attacks, and switch to 'Deathchasers' late game where the beefier attack can be more useful cleaning up stranglers. On the figures, I have them myself and I think they look fine. They're small I guess, but stylistically they're actually a really nice match with the classic figures. They have a lot of that scape 'meatyness' going for them, and they certainly don't look out of scale or anything like that. That's a fair point; it is a bit unrealistic. However, there's a few points of comparison among Small figures - the Axecutters have 4 attack against Large and Huge figures, the Goblin Cutters can subtract 2 defense dice, and the Wolves of Badru can get 5 attack with their Pounce. All of these are different circumstances, obviously, and the Kobolds are small even by Small standards, but it says to me that figures at that level can get into the 4-5 range under certain conditions. I think the Axegrinders are the best comparison - little guys that, thematically, are tenacious enough to do real damage if they need to. It's up to the individual whether it's justifiable, though. There’s a lot of heavy hitters at 120 points, a lot of diverse races, a lot of anti-squad heroes, and a lot of melee stand-alone heroes. But Asterios aims to put those all together and become the first 120 point anti-squad melee minotaur that ‘Scape has ever seen. We’ll see how he stacks up. A helpful comparison for Asterios is the Fen Hydra, a beefy multi-attacking hero at the 120 point slot. Asterios is faster, can move after attacking, has more life, and can keep his attacks up after taking hits. The Fen Hydra has higher attack, more maximum attacks per turn, and gets 6 defense against everybody. Certainly different, but they have enough similarities to say Asterios fits in at 120. He fits comfortably above figures at 110 such as Brunak or Moriko, but probably not as powerful as some figures at 130 (although many of those figures are underpowered). I love minotaurs. And the clip that came with the submission was exactly how Asterios was designed to be played, rushing through the small opponents and killing them was he goes. Feylund is the right planet, I’m glad that was picked over Earth. Marauder and Dauntless really work well to portray a solitary beast that will kill anything in its path. Legendary Creature 3 is one of my favorite powers that I’ve seen on an SoV submission. It’s simple, but effective. It translates the theme mechanically very well, as does the ignoring of LEA’s from small and medium squaddies while moving with Furious Charge. Although Furious Charge is based off of existing powers, it is tweaked perfectly to fit the minotaur’s theme. Asterios is designed to counter squads. That’s a welcome sight in the metagame that is sometimes called SquadScape. The trick is that he has to have weaknesses as well as his obvious strengths. Against an army that is dominated with Squad figures, say all 4th Mass, Asterios absolutely dominates. 6 defense is long enough to hold out for a while, especially when you can kill 2-3 opponent’s figures in a single turn. Asterios is fast enough that even ranged squads have trouble getting attacks in before they’re killed off. But if you throw a hero against Asterios, the story changes. Traditional squad+bonding hero armies still do fine, as long as our opponent can keep the hero alive to reach Asterios. Asterios can be used at any point in the game, including cleanup, because he’s so versatile. It all depends on the army you’re facing. If your opponent is leading with squad figures like M-43 Resistance Fighters, he can go and start doing major damage before your opponent can bring in hero backup. It’s unwise to try to use Asterios to counter heroes, because with only 3 defense, he doesn’t hold up long, and his single attack likely won’t through much. The value that you get out of Asterios depends on your opponent’s army composition. Not in a limiting way, but actually a way that encourages different army strategies. I would be very comfortable bringing Asterios to a tournament, as long as I had at least one other big attack in my army in case of strong heroes. But if I was lined up against Asterios with an army of Vipers or Greenscales or Microcorp Agents, I would be pretty scared (unless I also had Charos ). The one squad that does well against Asterios is the Axegrinders. With their stat boost against large figures, it goes a long way to help them out against 6 defense, and they can generally block his attacks of 3, at least better than many other squad. The ability to move before or after attacking really helped Asterios be able to get out of some dicey situations onto higher ground, or to be able to deny height advantage to several defending figures on the same turn. I really loved playing Asterios and I think he brings something new and different and fresh to the metagame. He’s really fun to play, and his mechanics bring across his theme perfectly. It doesn’t hurt that the miniature is gorgeous as well. to review the Kobolds of Idona Keep.